Roanoke Valley Ice Company produces Packaged Ice in a fully automated manufacturing facility in Roanoke Rapids, North Carolina. The ice never comes in contact with human touch. Ice is produced using high quality water and is frozen and stored in a refrigerated storage room. The ice is then transferred to the automated packaging machine where it is placed in a bag and sealed. After the ice is packaged, it is transferred to another freezer for storage until it is to be delivered. With the ability to produce over 75 tons of Packaged Ice daily and storage capacity for over 275 tons, we are able to handle any situation that may arise. Roanoke Valley Ice packaging plant is inspected by the National Sanitation Foundation (NSF) and the North Carolina Department of Agriculture. We are a member of the International Packaged Ice Association (IPIA) and an accredited Packaged Ice Quality Controls Standards Plus (PIQCSP) program member. Ice is sent to an Independent Certified Analytical Testing Lab for safety and to ensure the absolute highest quality Packaged Ice available. Started in 1925 in Roanoke Rapids, North Carolina as an ice and coal distributor, Roanoke Valley Ice Company has grown with the city and surrounding counties. As time has changed, so has the Ice Company. The company originally delivered blocks of ice by mule and wagon to homes for food preservation and coal for home heating. Then started to produce 300 pound blocks of ice for fresh produce so it could be shipped across the East Coast of the United States. Purchased by a local family in 1973, it has grown from a block producer, to a full service ice packaging and distribution facility. 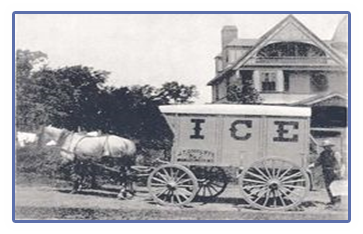 From the days of mule and wagon to today, Roanoke Valley Ice Company has worked hard to bring the finest quality ice and the best customer service to all of our customers.